SANS is a powerful technique to study the structure of opaque materials at size ranges of nanometers to 0.1 micrometer. Various components can be highlighted through the variation of the scattering contrast with selected deuteration. SANS is primarily used for projects in molecular biology and soft matter science (colloids, polymers, macromolecules & membranes and biological systems). 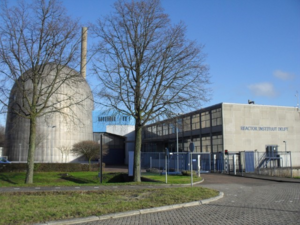 When the reactor there was decomissioned, the TU Delft inherited the apparatus, moved it to Delft and is now in the process of putting it back together. The NIST website offers very nice information on the technique and its possible applications. One example are block copolymer micelles as shown above. Such micelles have a well-defined core/shell structure. Like micelles that are formed by surfactants or lipids, block copolymer micelles are able to solubilize hydrophobic molecules in the micellar core. This is used e.g. in chemotherapy to deliver hydrophobic drugs like doxorubicin or daunorubicin to tumor cell ("Drug Delivery Systems"). With SANS, the structure of such micelles can be elucidated. At the wonderful ILL website, you can see a movie demonstrating how a SANS instrument works.